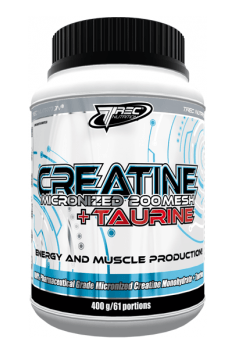 Trec Creatine Micronized 200 mesh + Taurine is a product which contains crystal pure creatine monohydrate with the addition of taurine. Creatine – an organic chemical compound found mainly in muscles and tendons. It was discovered in skeletal muscles by Michel Eugène Chevreul in 1832. It is active in cells, where it stores and transports high-energy phosphate bonds obtained from mitochondrial ATP that does not have the ability to move on its own. Taurine – a non-proteinogenic sulphonic acid. It is commonly used as an ingredient of energy drinks because of its ability to inhibit the serotonergic system and its antagonistic effect on GABA receptors. It conjugates bile acids before removing them from the liver. It affects insulin metabolism and supports the transport of creatine to muscles. L-Ascorbic acid (vitamin C) – one of the basic vitamins, soluble in water. It is essential for the normal functioning of the human organism. It deficiency leads to scurvy, among other disorders. It exhibits antioxidant properties, so it helps to neutralise excess free oxygen radicals. It also participates in the process of collagen synthesis. Creatine micronization means that its molecules are strongly fragmented, thanks to which it has the form of a very light liquid. Smaller molecules can be absorbed from the gastrointestinal tract to the circulatory system more efficiently. Thanks to that, the concentration of creatine in the organism can increase faster than in the case of a non-micronized form. Sometimes creatine supplements cause mild intestinal problems, particularly in people whose bowel is normally sensitive. The fragmentation of the material allows to reduce the probability of unpleasant symptoms occurring. Smaller molecules are much friendlier for the digestive system. Creatine transport engages insulin, among other substances. As it turns out, taurine is one of the factors that can affect the functioning of the pancreas and have an insulin-mimetic effect, that way making the transport of creatine to muscles more efficient. Taurine and vitamin C help to strengthen the defence of cells from the activity of reactive oxygen species, produced in large amounts during heavy workout. Creatine along with taurine can help to increase the speed of regeneration of damaged muscle fibres after workout. Thanks to that, it is possible to increase training volume or frequency, which gives muscles a stronger impulse to develop. Creatine is one of the most versatile agents, as it works at the very base. It enjoys particular interest among people who do endurance sports and the fans of workout in a gym. People who do cycling or long-distance running will undoubtedly benefit from the potential effect of reduced tiredness. Apart from that, faster regeneration of energy molecules, that is ATP, provides a longer supply of fuel for working muscle structures. Bodybuilders and strength sports fans can find a bulk of benefits in this amazing supplement. It is remarkably efficient in increasing the volume and strength of muscles you are working on when combined with appropriately intensive training and calorie surplus. Creatine increases physical capacity in the case of subsequent short, intensive exercises, as it takes place in the case of strength workout. It is hard to come by a supplement for sportspeople that could show off such a rich documentation in the form of scientific studies that confirms its properties. In the time of constant competition among supplement producers and continual introduction of new products, it is worth to give it some thought and choose those that are well tested and undeniably efficient. Good health is a crucial factor for achieving good results in sports, so let’s take a look at the opportunities that the supplement by Trec offers. One of the most common factors that have a negative effect on overall health is excessive oxidative stress. As mentioned above, vitamin C along with taurine can neutralise the harmful by-products of aerobic transformations, that way protecting healthy cells of the organism from damage. Taurine and creatine is a duo that can be of help in problems with sugar metabolism. Creatine exhibits the ability to inhibit excessive blood glucose spikes after a meal. Taurine, on the other hand, is known for its anti-diabetic properties, which it owes to the beneficial effect on the health of the pancreas. Trec Creatine Micronized 200 Mesh + Taurine is recommended for fans of all sport disciplines for improving results without side effects that would be dangerous for health. It seems particularly beneficial for strength and endurance sports and bodybuilding. Capsules: I portion (4 capsules) 30 minutes before training, II portion immediately after training. Powder: I portion (1 scoop) 30 minutes before training, II portion immediately after training. Capsules: I portion (4 capsules) in the morning after waking up, II portion before sleep. Powder: I portion (1 scoop) in the morning after waking up, II portion before sleep. Using creatine is recommended both to beginners and advanced sportsmen as well as to other physically active people. The newest research show that around-training supplementation works best, only on training days without the division into cycles. The best results will be achieved when taking 2 doses every day, one in the morning, the second after training or between meals on non-training days. The effectiveness of creatine may be increased by taking it along with glucose or dextrose, drinking a lot of water and using it on an empty stomach.